Non-Mom's Blog | Everything But The Kid! Posted on February 24, 2016 by NonMom: Everything BUT the Kid! This is what we were feeling like last weekend when I even managed to get out for not one, but two outdoor runs…in Southern Ontario. So I was feeling pretty confident in the groundhog who informed us by not running away from his shadow a few weeks ago that spring was indeed coming. Then this happened. Don’t let the happy heart shapes fool you, it’s cold and wet and miserable. Overall, I am absolutely not complaining about this winter. It has plain and simply rocked and after last year when it was just unbearably awful. Seriously, I think I wore a minimum of 3 layers every day for around 8 weeks straight (or more) and I still couldn’t get warm enough. Posted on February 23, 2016 by NonMom: Everything BUT the Kid! I have officially decided spring is upon us. I am also choosing to ignore the dire warnings for this week where I live of potential snowstorms and instead focus on the season that is just begging to fully arrive any moment…really, any moment now….how about now? Nope, not yet huh? Alright, what we’ll do instead is plan ahead and daydream about the parties we’ll attend, and the treats we’ll have…and enjoy with some tips from my friends at ProNamel. I felt it important to go to the experts for us so we’re all set for maximum enjoyment. I do, in fact, have sensitivity as a result of enamel loss and am a very long-time user of Sensodyne and ProNamel. ‎At the bevvy of parties and fun gatherings a multitude of cocktails and assorted beverages make an appearance, from wine to hot apple cider and hot chocola te (still in season and lovely). What are ‘better’ choices and ‘less than ideal’ ones that might put a sour note on the event? Beverages that are often served at parties like red wine, white wine, apple cider and hot chocolate are high in acidity and have the potential to cause long-term erosion and tooth wear. Other beverages that are high in acid include soft drinks, coffee and tonic water. Interestingly enough, a recent survey conducted by GSK revealed that Canadians rank coffee and wine among their favourite beverages but the majority don’t realize that these beverages are acidic. I try my darndest to eat a lot of fruits and veggies at parties to offset a couple of treats. Are there any in particular I, and others like me, should avoid or gravitate towards in order to not eat too many of those craved sweets? Fruits and vegetables like broccoli, cucumber, avocados, bananas which are many of our favourite foods are low in acid. Fruit like blackberries, blueberries, cherries, cranberries, grapes, grapefruit, lemons, limes, pineapples, pomegranates, raspberries and strawberries are high in acidity. But you don’t have to give up on your favourite appetizers. Canadians can still enjoy the foods they love without compromising the strength of their teeth. Utilizing proper oral hygiene techniques and using a toothpaste specifically designed to help protect against the effects of acid erosion can help to mitigate the harm done by acidic foods. Toothpastes such as ProNamel help strengthen and re-harden acid-weakened enamel making it healthy, stronger and better-protected so it’s more resistant to enamel loss and future Acid Wear, which could lead to sensitivity. Chocolate? Cookies? Brittle candy? Cakes? Which are better ‘not so great’ choices? Apart from the issue of introducing sugar to the teeth, the sweet items mentioned have other damaging effects. Most of us are well aware of the benefits that cocoa provides. However, chocolates may also contain caffeine which can exacerbate acid reflux for those suffering from the condition. Therefore, for those people, eating chocolates in moderation would be the key to reducing acid challenges on the enamel. Candies and cookies that are of hard consistency can introduce micro fractures in the enamel. Furthermore, enamel that is already weakened by acid can fracture or simply chip away small portions at a time. For this reason, hard foods such as brittle candies, nuts and hard candies should be avoided at all times. I’ve heard that sometimes straws help with beverages, is that an option? Difficult with some drinks for sure, but perhaps with others it might work? To help reduce the risk of enamel wear there are many things you can do. You can try reducing the amount of time that acids are in contact with the teeth. To minimize swirling, swishing or holding acidic drinks in your mouth, you can use a straw. Make an appointment to see the dentist. They will be able to look at your teeth for early signs of Acid Wear and assess levels of risk likely from your diet and brushing habits. Try not to brush your teeth immediately after eating or drinking acid foods and beverages, and make sure you’re using a soft bristled brush. Ideally wait 30 minutes before brushing. Encourage children and teenagers to brush twice a day with a toothpaste like ProNamel to encourage good brushing habits and prevent future acid challenges. Enamel loss is caused by acids acting on the tooth’s surface. In fact, as few as four acidic exposures a day can put tooth enamel at risk of Acid Wear. Each time teeth are exposed to acidic food or drinks, the acids can weaken the enamel as it loses minerals, making it easier for the enamel to wear away. If enough of the enamel wears away the dentin layer becomes exposed and the nerve in the center of the tooth becomes susceptible to stimuli, resulting in a short, sharp pain caused by certain triggers, such as hot and cold foods and beverages. ProNamel toothpaste builds up a protective barrier and insulates the nerve (with twice daily brushing) so you can keep enjoying hot and cold beverages. Visit www.pronamel.ca for more information on Acid Wear, its effects and its causes. Merry Christmas Wishes to All! Posted on December 24, 2015 by NonMom: Everything BUT the Kid! Posted on December 4, 2015 by NonMom: Everything BUT the Kid! A simply fun post for your Friday, aka ‘weekend-eve’. I love Christmas. I love decorating for it. I love the specials on TV (Rudolph remains my fave) and I love the calm that always happens between present opening and breakfast. It’s something I cherish. Hubby is trying as it isn’t his thing as much as mine and every year I put in a special effort for him. We have started a new tradition, it qualifies because we’ve now done it 2 years in a row, and that is to have our picture taken with the big guy, Santa himself. Step 1: Get him interested in decorating‎. How did I accomplish this? I found ornaments just for him. 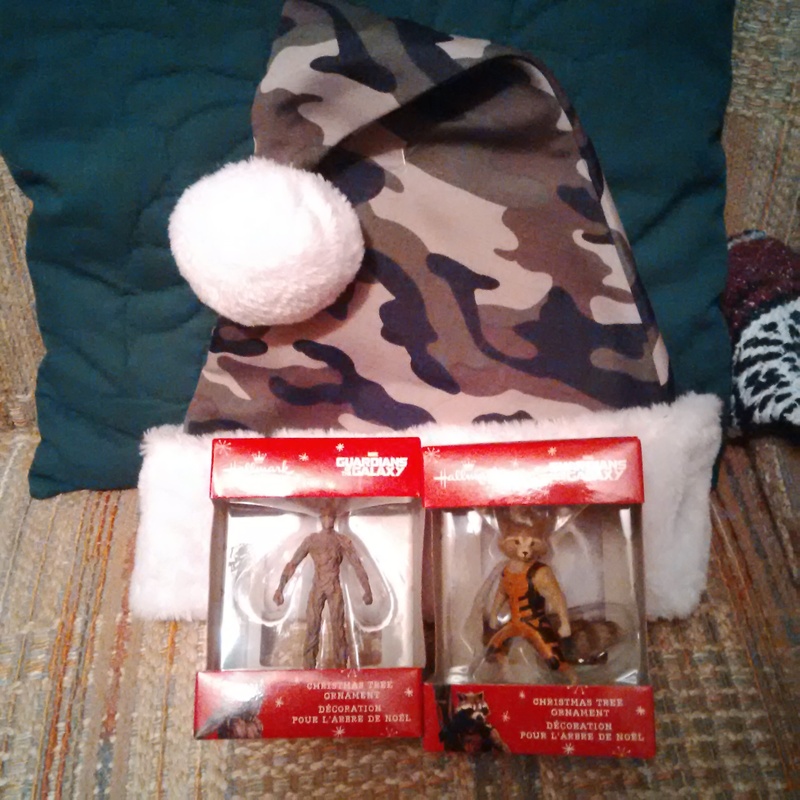 He is a big Rocket Raccoon fan, also Groot, so I found them as ornaments :). Step 2:‎ Get him involved with ‘the big guy’. We went to visit Santa at Bass Pro Shops. Win for the wife! 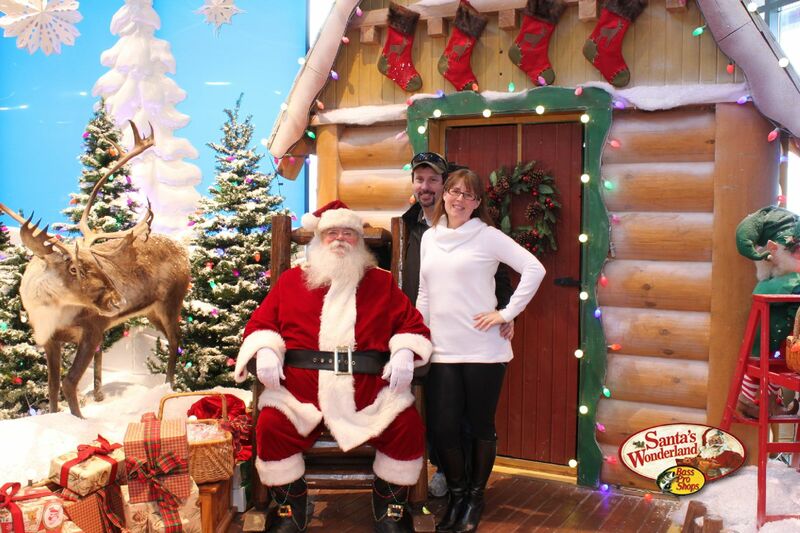 I got to be a big kid and go through Santa-land and get into the fun with the families in line with us (so much fun! ), and he got to shop for bbq and smoker accessories and items after. Step 3: Then, I found the crown jewel of my plan. A definite hubby friendly way to celebrate the day. His very own Santa hat! Styled according to what he would actually wear too, in camo! Step 4: Christmas Eve. I’ve informed him we’re watching my favourites on tv/Netflix: Rudolph, The Polar Express, Santa Claus is Coming to Town (I love Topper the penguin) and Frosty. I’m also hoping to go for a drive and see all the lights :). We’ll see how this goes. So far, so good. Posted on November 30, 2015 by NonMom: Everything BUT the Kid! The holidays and baking go hand-in-hand and I know every year I try to come up with a fun new recipe to try out, I try to top myself and usually when I start doing my recipe searches I get intimidated and can’t get over the amazing creations others come up with. Here’s where Becel’s ‘Anything Goes’ Cookie Dough recipe comes in. It’s a lovely basic dough and you can add all sorts of things to it without having to find a whole new recipe (but your cookie-eating friends likely won’t notice –wink wink). Deciding what to bake each holiday season can cause stress, but with this recipe you can do a half-batch one style, and the other another. Definitely a way to get more out of your dough ;). And, just in time for the holidays for the baker in your life, Becel is having a fantastic contest! Read on for the details! I’m thinking of adding some of the leftover Halloween candy to make my dough and cookies more fun! How yummy does crushed up peanut butter cups sound? Or Reese’s Pieces? Mmmm! Preheat oven to 375°F (190° C). Combine flour, baking soda and salt in medium bowl; set aside. Beat Becel® Buttery Taste margarine with sugars in large bowl using electric mixer until light and fluffy, about 3 minutes. Beat in eggs and vanilla until blended. Gradually add in flour mixture; beat just until blended. Add your choice of mix-ins (i.e. chocolate chip, dried fruit, seeds, toffee bits, etc.). Drop by tablespoonfuls on ungreased baking sheets, 2-inches (5 cm) apart. Bake 7 minutes or until edges are golden. Cool 2 minutes on wire rack; remove cookies from sheets and cool completely. Get into the holiday spirit by #BakingWithBecel! Share a photo of your Anything Goes Cookie Dough creation with Becel on Facebook, Twitter, Instagram or Pinterest and be entered for your chance to win 1 of 4 baking prize packages valued at $625! See below for additional details, and be sure to visit becel.ca for the full rules and regulations, or click here. To enter, participants must post a photo of their baked-with-Becel creation alongside a Becel tub to Instagram, Twitter, Facebook or Pinterest using the hashtag #BakingWithBecel and tagging Becel’s pages where appropriate. Each week, one winner will be drawn to win a #BakingWithBecel baking prize pack valued at $625. Baking prize packs include a 5.5 quart stand mixer, baking sheet and set of measuring cups and spoons from Cuisinart Canada, four packages of HERSHEY’S CHIPITS Baking Chips and product coupons from Burnbrae Farms (outside Atlantic Canada) and Becel! To be eligible to enter the contest, an individual must be a resident of Canada (excluding Quebec) and have reached the legal age of majority in his/her province or territory of residence. Posted on November 29, 2015 by NonMom: Everything BUT the Kid! Yes you read that right, plus, it remains one of my favourite movies to this day. I was asked to babysit my adorable neice and nephew (he’s my mini-me I swear), and overall I’m pretty pleased at how it went. I adore them, however I don’t see them as much as I’d like as my schedule doesn’t match up with theirs as often as we’d all like. But I assure you, I adore them. Now, it is important to note that in my teen years I did a lot of babysitting, like A LOT a lot of babysitting. I loved it. I had a couple of regulars and I was known for my grilled cheese sammiches and also my love of crafting, board games and Disney movies. But it’s been a while. And I admit, I was a little bit nervous. So, I decided on a plan, my nephew has been wanting me to teach him how to knit so I took along my loom (I taught myself for him as I’m a crocheter) and some yarn and he and I had a blast. My neice is younger (he’s 5, she’s 2) so was understandably a little confused when I arrived to get her from her nap instead of her regular sitter, or her mommy or daddy, or, my mom or dad. It took a bit of explanation (no no, mommy at work, so is daddy, you have Aunty Amy today), but she relented and even let me change her pull-up. The kids played, and nephew-kins knitted with me (we traded off rows on the loom) and then the giggling started as the kids warmed up and indeed perked up around me. We were all giggling before long and the neice and I happily played with Mr. Potato Head while nephew-kins did some extra rows all by himself. Hashtag #ProudAunty on that one :). We laughed, we smiled, they loved being called Goofball 1 and Goofball 2 and when their daddy came home I was admittedly a little sad as we had been having such a fun time. All in all, a success. Babysitting skills somewhat updated (we’ll tackle a meal next time), happy munchkins and very happy Aunty:). Posted on November 13, 2015 by NonMom: Everything BUT the Kid! Renos. Yup, we made the decision that since our home’s location is pretty much perfect we’re acknowledging that some updates need to happen. ‎This year, after staring at my too dark living room I finally snapped and it was painted. It took three days, but it was worth it, I cannot get over how a little paint can make such a BIG impact in a space. Phase two has been the kitchen. I loathed it. I’ve put up with it since 2002 and enough was enough. This project took a lot of research, tears, compromising and planning, but it’s finally coming together. After my tears of realization of what a new (or even re-faced) kitchen was going to cost, hubby and ‎found a solution: new doors and hardware (we re-used our hinges) and a new hood. After ordering the doors my sanity returned, then the insanity set in as I waited, and waited for them to arrive. They were a couple weeks late, but oh so worth it. Then, the insanity kicked up again as adjustments had to be made on our present cupboards. Things were banged, tools were worn out, new ones were purchased. A process I thought would be quick is on week two now. It has been a process, and it’s not over yet (4 handles to go and the hood! ), but it’s close. And I’m calming and realizing that’s OK.
And then we’ll go to phase three…‎my poor husband ;).